Supporters of DRC opposition leader Felix Tshisekedi celebrate his presidential election win. Cape Town — The inauguration of Felix Tshisekedi as president of the Democratic Republic of the Congo has been postponed. Government spokesman Lambert Mende did not give reasons for the delay, but said it would probably take place on Thursday, the Associated Press reports. 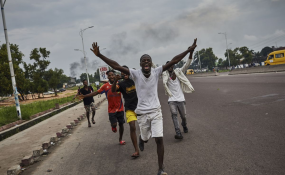 On Monday, Congo police dispersed a gathering of supporters waiting to hear a speech by presidential runner-up Martin Fayulu, his spokeswoman said. Dozens of people gathered outside his coalition's headquarters in Kinshasa before police arrived and cancelled the event, Eve Bazaiba told AP. On Sunday, the Constitutional Court refused Fayulu's request for a vote recount and reaffirmed Tshisekedi's victory in the presidential race.